High-resolution scanning tunneling microscope image of stanene prepared on a Ag2Sn surface alloy. A model of the structure of stanene is superimposed top left. Image: Junji Yuhara. Sometimes it pays to be two-dimensional (2D). The merits of graphene, a 2D sheet of carbon atoms, are well established. In its wake have followed a host of ‘post-graphene materials’ – structural analogues of graphene made of other elements like silicon or germanium. Now, an international team led by researchers at Nagoya University in Japan has unveiled the first truly planar sample of stanene: single sheets of tin (Sn) atoms. Planar stanene is hotly tipped as an extraordinary electrical conductor for next-generation technology. The team also included researchers from Aix-Marseille University in France, the Max Planck Institute in Hamburg, Germany, and the University of the Basque Country in Spain. Just as graphene differs from ordinary graphite, so stanene behaves very differently from humble tin in bulk form. Because the electrons in heavy elements have relatively strong spin–orbit interactions, single-layer tin is predicted to be a ‘topological insulator’, also known as a quantum spin Hall (QSH) insulator. Materials in this remarkable class are electrically insulating in their interiors, but possess highly conductive surfaces and edges. 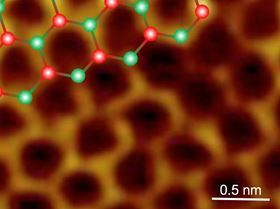 This, in theory, makes a single-layered topological insulator an ideal wiring material for nanoelectronics. Moreover, the highly conductive channels at the edge of these materials can carry special chiral currents in which the spins of the electrons are determined by their direction of travel, making topological insulators very appealing for spintronics applications. In previous studies, where stanene was grown on substrates of bismuth telluride or antimony, the tin layers turned out to be highly buckled and relatively inhomogeneous. The Nagoya team instead chose silver (Ag) as the substrate – specifically, the Ag(111) crystal facet, whose lattice constant is slightly larger than that of freestanding stanene. This led to the formation of a flattened tin monolayer over a large area, moving one step closer to scalable industrial applications. The researchers deposited individual tin atoms onto silver through a process known as epitaxial growth. Crucially, the stanene layer did not form directly on top of the silver surface. Instead, as shown by core-level spectroscopy, the first step involved the formation of a surface alloy (Ag2Sn) between the two species. Another round of tin deposition then produced a layer of pure, highly crystalline stanene on top of the alloy. Scanning tunneling microscopy showed striking images of a honeycomb lattice of tin atoms, illustrating the hexagonal structure of stanene. The alloy guaranteed the flatness of the tin layer, as confirmed by density-functional theory calculations. “Stanene follows the crystalline periodicity of the Ag2Sn surface alloy,” explains Junji Yuhara at Nagoya University, lead author of a paper on this work in 2D Materials. “Therefore, instead of buckling as it would in isolation, the stanene layer flattens out – at the cost of a slight strain – to maximize contact with the alloy beneath.” This mutual stabilization between stanene and the substrate not only keeps the stanene layers impeccably flat, but lets them grow to impressive sizes of around 5000nm2.